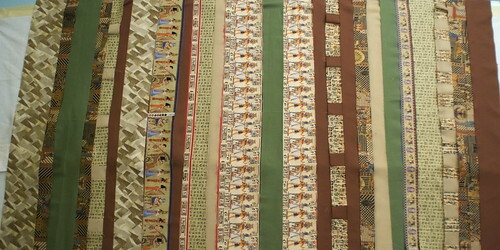 Jacob and I have been planning a quilt together for a while, but the scarcity of Egyptian-themed fabric has forced us to make guesses in our purchases, which has led to a wee bit of adventurous over-buying. As a result, instead of the single large Egyptian-themed quilt we'd both had in mind, we realized the only way to make sense of the mishmash of fabric we had was to turn it into three quilts: one queen-sized, and two smaller. Blue Lotus will be the major quilt, since we had the most fabrics with a sandy undertone, and the one needing the most time and effort. The other two color sets needed names. 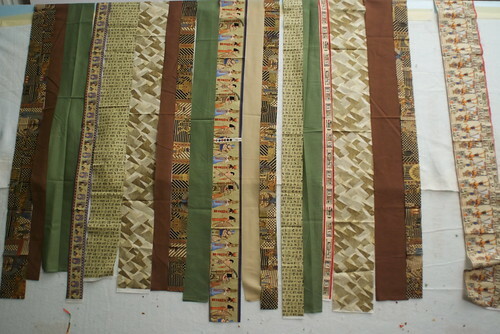 Jacob suggested 'papyrus' for the pale green quilt, and 'desert rose' seemed obvious for the red/burgundy-themed quilt. You'd think a strip quilt would be easy, but there are lots of ways to go wrong, and I'm pretty good about finding them. I'm not sure I'm there yet, but I know I'm significantly closer to a final layout than I was two days ago. This color palette has me well out of my comfort zone. 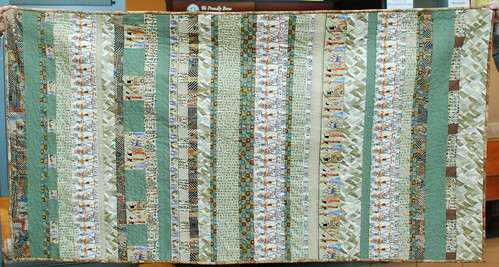 I gravitate to jewel tones, blues, and greens, but this quilt is a study in gold, tan, brown, and sage green. It's a stretch, to put it mildly. Learning experiences are a good thing, though, right? The goal isn't to obsess over this quilt for ages; it's to cut it simply, find a pleasing arrangement, quilt it, and be done with it. Have I mentioned that I'm not good at NOT obsessing? Also, as someone who has been given the gift of quilt love, I know it will look amazing in the end. Agreed on both counts. I think the brown will work best in a different quilt. I was so sure it would work in this one, but as soon as I started taking it out, I was immediately happier. I think the light blue fabric might work with the blue in that round metallic you added; it would be worth refolding it into a strpi to see. 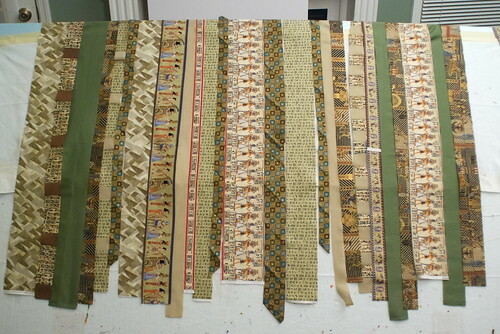 Also, I think we agreed in chat that "Cairo Sunset" will work as a name for the warmer-toned small quilt. The brownish fabric will look better there. It is more beuatiful in person! We're planning a trip the week of Independence Day to visit with my mom, and we'll gift it to her then. Should be a complete surprise!